The Korean artist Do Ho Suh is the clear winner here, with the Smithsonian American Art Museum show’s ubiquity on Instagram reflected in remarkable daily footfall figures. The Guggenheim in Bilbao has three shows in the contemporary top ten (and two in the Post-Impressionist and Modern category). While Joana Vasconcelos has been creating crowd-pleasing works for years, the presence of Javier Téllez speaks volumes about the ability of museums like the Guggenheim to entice vast new audiences to artists. Unlike 2016, when it had four entries in this category’s top ten, and in 2017, when it topped the category, the Saatchi just makes it in at number nine, with its Art Riot show, presented by the Tsuknanov Foundation. 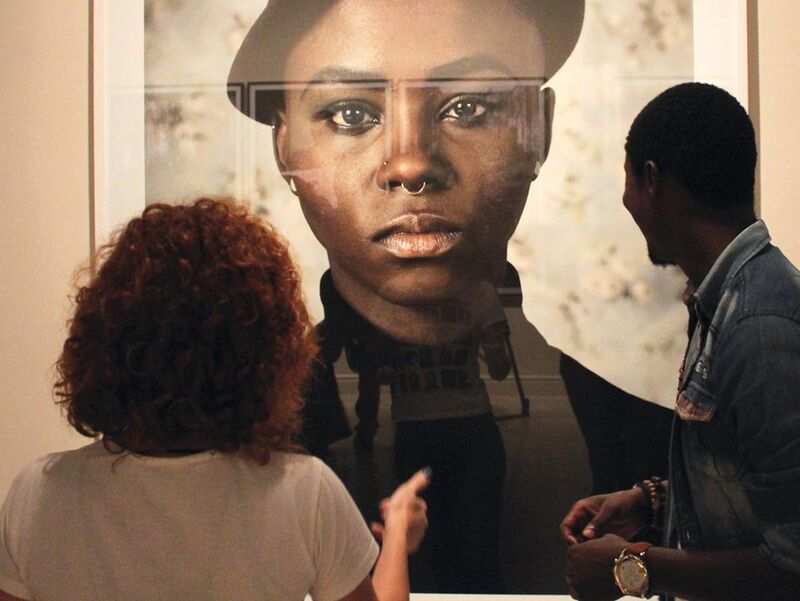 The Rio de Janeiro branch of the Centro Cultural Banco do Brasil features twice in the top ten with free shows—one on digital arts and the other on contemporary art from Africa. The Guggenheim in Bilbao not only has three entries in the Post-Impressionist and Modern category’s top ten, it also tops the list. Chagall is not the most critically acclaimed of 20th-century artists, but he is perennially popular. The same cannot be said of Anni Albers, whose pioneering work is only now gaining a significant audience beyond aficionados of Modernism. For Albers to have significantly higher figures than Giacometti at the same venue reflects a big shift. Gauguin taking the number two spot with a show in Paris is no surprise, nor is Van Gogh being big in Japan. The influence of Japanese prints on the Dutchman’s painting is explored in a travelling show that features twice in our top ten. The Kyoto leg helped the National Museum of Modern Art achieve its highest ever overall attendance. 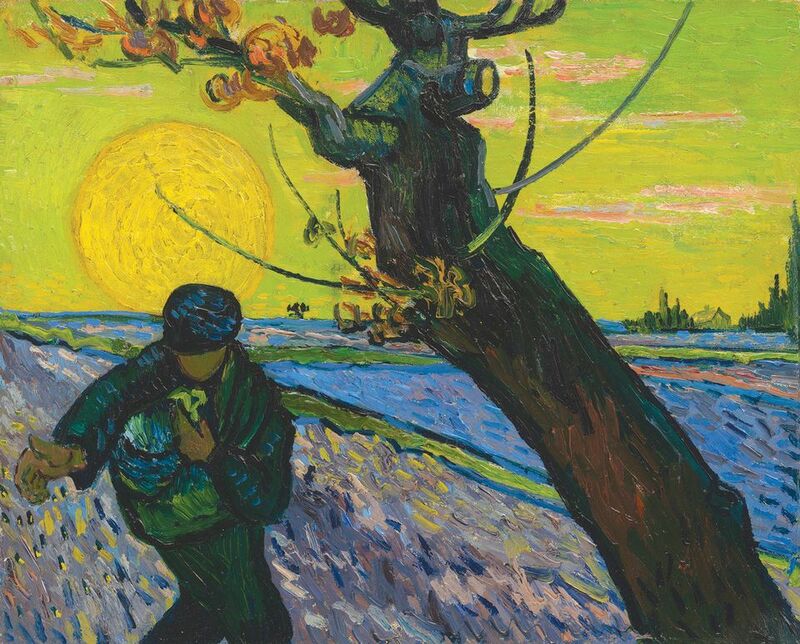 “People in Japan love Van Gogh,” says a museum spokesperson. The first notable thing about the figures for 2018 compared with those of the previous few years is the absence of rogues—one-off monographic shows of little known artists such as Giovanni dal Ponte and Cristóbal de Villalpando (2017), or the San Benedetto Group and Botticini (2016). This top ten list is Premier League. 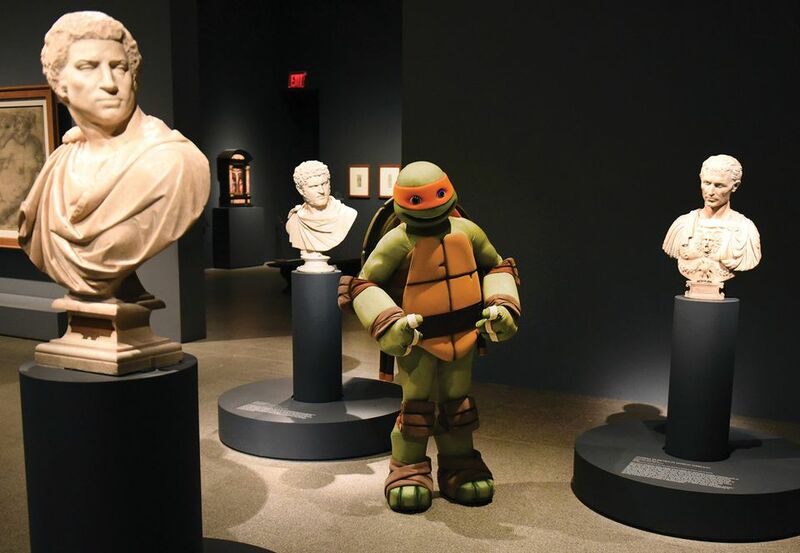 An Italian artist leads the Old Masters category (and comes second in the overall rankings) for the first time in years thanks to the Met’s exhibition on Michelangelo (7,893 visitors a day). The list also shows that presentations of Baroque artists, including Caravaggio and Vermeer, outnumber those of Renaissance masters for the first time in several years. Tokyo always scores over other cities, and this year is no exception, with the Japanese capital boasting two shows in the top ten. London’s Royal Academy of Arts makes its first ever appearance in our top ten in this category with its major exhibition on the collection of Charles I, which drew 3,250 visitors a day. The one artist who can always be relied on to feature in the top ten of 19th-century exhibitions is Monet. In 2018 he featured twice (three times, if the Impressionist Masterpieces show at Tokyo’s National Art Center is included). The other safe bet is a general survey painting show in any part of the world. For the first time in many years, Tokyo has been ousted by Shanghai in amassing most daily visitors in this category (no doubt a combination of demographics and marketing). 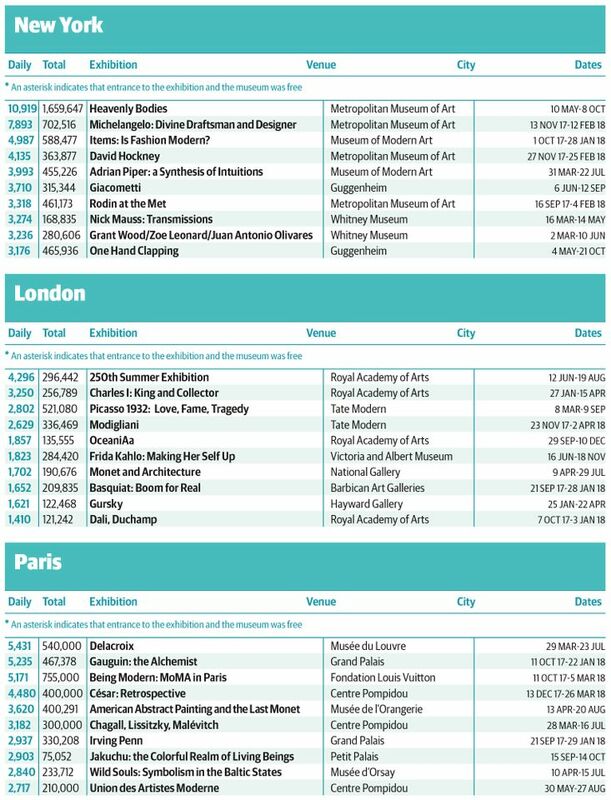 As ever, high numbers of visitors attended monographic shows, and 2018 saw Rodin, Sargent and Delacroix in the top ten. It’s hard to predict which individual artists will be popular—in previous years artists such as Ingres, Degas, Renoir, Turner and the Pre-Raphaelites have all featured in the top ten. Can simply the fact that it was a free exhibition explain the huge numbers for the Shanghai show of the rather peripheral Russian realists, The Wanderers? Although the Carmignac Photojournalism Award tops the photography category, its per-day visitors at the Saatchi Gallery in London were significantly lower than when the gallery topped the same category for 2016: almost 2,000 a day fewer in 2018 than the 5,674 who rocked up daily in 2016. A notable aspect of the latest list is the mini-battle of the solo shows—all of them paying exhibitions—between five very different legends of the medium: Robert Frank, Irving Penn, Stephen Shore, Walker Evans and Susan Meiselas. And it is Meiselas who emerges the victor, with 3,546 visits a day to her exhibition at the San Francisco Museum of Modern Art (SFMoMA). While the Evans show at the same venue, Shore at the Museum of Modern Art in New York, and Penn at the Grand Palais in Paris all had larger total visitor figures than the Meiselas exhibition, those three other exhibitions ran for significantly longer. 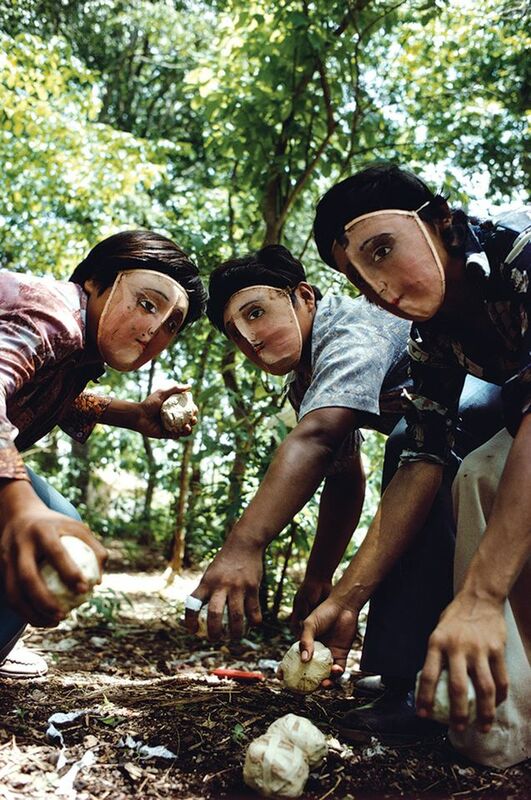 Meiselas’s triumph is a coup in a field with a reputation for being macho. Perhaps Heavenly Bodies got a little divine help to rank first not only in the New York top ten but also in our overall survey. With a remarkable 10,919 visitors a day across the Met’s two buildings, the exhibition also proved to be the most popular in the institution’s history, attracting nearly 1.7 million visitors in total. But the heavenly host was not finished, as the second most popular exhibition was the Met’s Michelangelo show, which included a recreation of the Sistine Chapel ceiling, replete with that most famous of godly gestures. A shout-out has to go to MoMA’s Adrian Piper show, which achieved impressive figures for a career survey of the conceptual artist. The issues Piper tackles in her work—racism and misogyny, among others—were at the forefront of national debate last year. 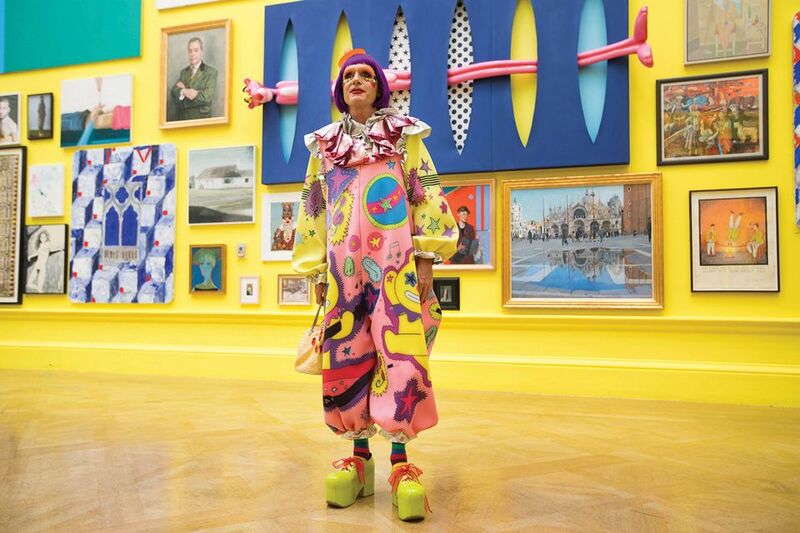 In London, the art-world-meets-jumble-sale that is the Royal Academy of Arts’s (RA’s) Summer Exhibition was not only the most popular ticketed show in town, but the most popular edition of the annual show—now in its 250th year—in the history of our survey, no doubt helped by chief guest curator and media darling Grayson Perry. The exhibition beats the RA’s critically acclaimed Charles I show into second, while Tate Modern’s Picasso 1932, focusing on a single year of the artist’s career, takes bronze. Although the Musée du Louvre usually ranks as the most popular museum in Paris, it has been well over a decade since one of its shows took the top exhibition spot. But a bumper year for the Louvre, combined with the works of the greatest French Romantic artist, meant its survey of Eugène Delacroix wooed critics and crowds alike. A new entry has gone in straight at the top, pipping 2017’s highest ranked event, Art Night. The fourth edition of the Dhaka Art Summit included more than 300 artists across ten exhibitions at the Bangladesh Shilpakala Academy and had a whopping 35,222 visitors a day (it is the first time we have obtained figures for it). 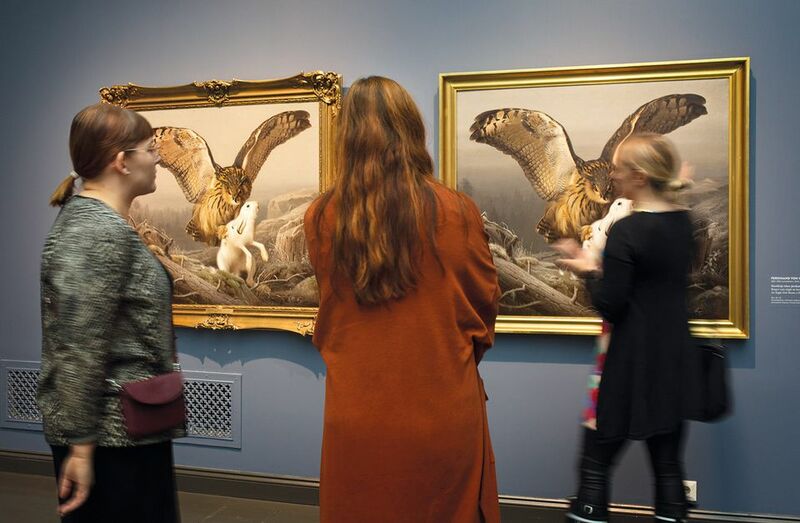 Such events may be visited by the same people multiple times and that is why we have a Big Ticket category, which covers events that cannot be properly compared with regular museum exhibitions. These include: biennials and festivals; shows where the ticket covers entry to other attractions, such as the palace and gardens of Versailles; and displays staged in a museum’s main lobby, such as Tate Modern’s Turbine Hall. 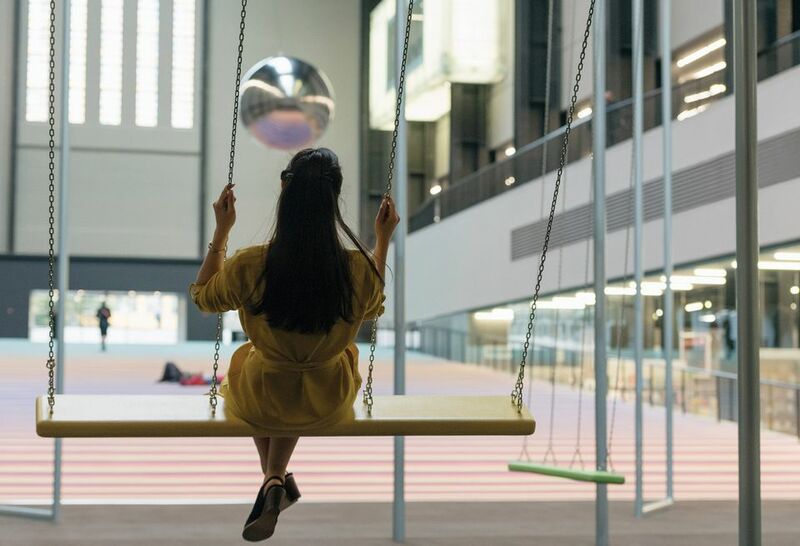 Last year’s Turbine Hall commission by the Danish collective Superflex extended beyond the confines of the museum out into the street, with several linked swings encouraging visitors to play together. The London museum’s BMW Tate Live Exhibition also makes the list with performances and installations inspired by—and including—the veteran video and performance artist Joan Jonas, which took over the former power station’s old oil tanks. Another new entry is the Light to Night Festival in Singapore, which, like Art Night, brought art lovers out after dark for interactive installations.